Amble West Cemeteries contains 23 Commonwealth war graves of service personnel from the two world wars- 9 World War I and 14 World War II- as well as several family headstones remembering those who died and are buried or commemorated abroad. Many of these are listed on the town’s war memorial clock tower in the town square. The War Graves Commission is responsible for the stones themselves and their replacement but a small management fee is paid to the Council to maintain public access to these areas. If you are searching for information regarding a war grave, the Commonwealth War Graves Commission should be contacted. RADCLIFFE MEMORIAL – both memorials are Grade ll listed buildings. that area was incorporated into the Square. 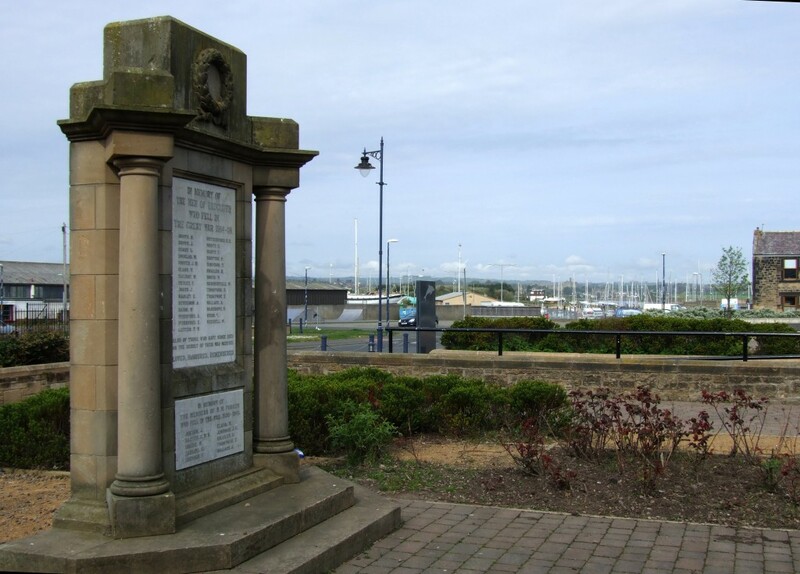 Now only the land on which the 2 memorials and the flagpole are located are owned by Amble Town Council; the rest is the responsibility of Amble Development Trust. 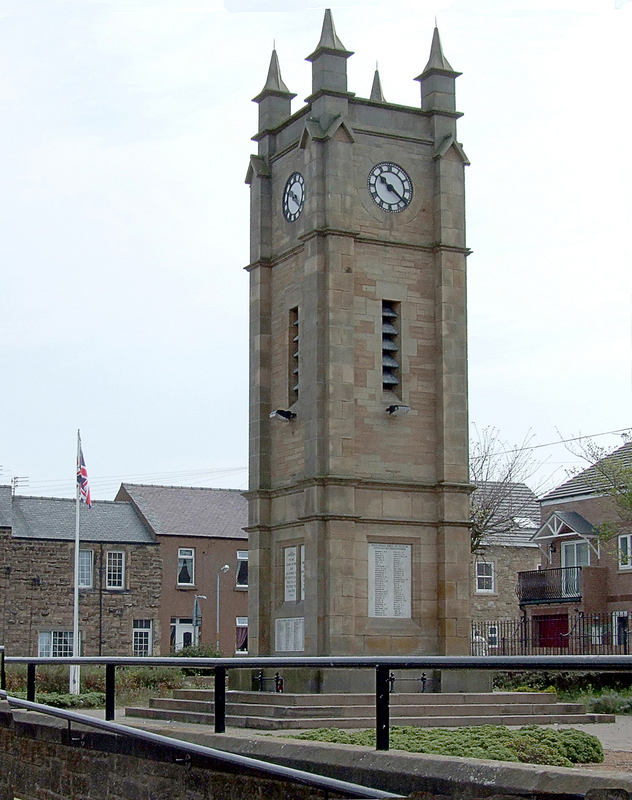 Amble Clock Tower memorial is built of stone with a three step base. The panels are white marble using lead inserts for the inscriptions. The land was donated by Mr E.M. Lawson –Smith; the foundation stone was laid in August 1924 by Mr R.C. McInnes, the town’s oldest inhabitant and the memorial was unveiled in May 1925 by Major Vernon Merivale, M.C. Mr Lawson- Smith and Major Merivale had both lost sons in the First World War. It is a remarkable tribute to local people by local people as it was paid for by fund raising and public subscription in the town itself (estimated total of £2100), designed by William Burton, Surveyor to Amble Urban District Council, built by R. Carse & Sons of Amble and the sculptors were Messrs. Whittle & Sons of Amble. Unfortunately though the clock, being of a specialist nature, is not local but was made by W. Potts & Sons of Leeds, a renowned national Clockmaker of that time and for many years afterwards. More detailed information is held in the archives at Woodhorn Museum. A commemorative panel was added after World War II to commemorate those who local men lost their lives in that struggle. 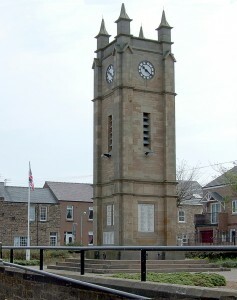 In 2008, Amble Town Council, helped by some grant funding from the Wolffson Foundation & the War Memorials Trust, undertook a restoration of the memorial including the clock faces and dials; the internal working mechanism of the clock has subsequently been overhauled and modernised as far as is possible with a listed building. Due to its specialised nature, this work cost in the region of £30,000 so it is very disheartening when vandalism takes place and graffiti appears yet again. In 2014 a memorial turf area was laid by volunteers from Pride in Amble as an area where small wooden poppy crosses could be placed. This was used for the first time in that August when the town held a commemoration service for the 100th anniversary of the start of WW1. 179 crosses were placed here by the community, each cross bearing the name of a man on a memorial in the town. Each person placing a cross was presented with a specially commissioned limited edition mug to commemorate the event. In late 2016 extensive damp was discovered and upon investigation it was found that the roof drainage system had been blocked by footballs. The internal floors were in various stages of disintegration and the damp had affected the clock mechanism. It was vital that surveys were conducted to find the likely cost of repairing the damage caused. A conservation specialist was consulted and initial estimates were over £30,000. However when it was decided to go ahead with the work and more detailed specifications including amending the roof to enable access from within were drawn up, the cost escalated to approx. £48,000. To help with this cost, a grant application to the War Memorials Trust is currently being considered, but this wonderful community has taken the project to heart and is raising funds to help. There have been evening entertainment events, savings competitions, a household coffee morning and one of our own veterans, Peter Proctor- Canon, has spent many weekend hours beside the memorial inviting contributions to the fund. It is heart warming that this memorial originally erected by public donation and fund raising is once again benefitting from its own community’s efforts. this memorial except that fund raising was taking place in 1925 and it was possibly dedicated in 1928. It was positioned at the roadside on the southern edge of the village opposite most of the houses but was moved here when Radcliffe was opencast for coal in the early 1970s and most of the people relocated in Amble. The memorial was restored in 2013. In 2014, a book ‘In Memory of the Fallen’ was produced to give some background of the town before and during the years of WW1. It also included information on the names on all the memorials within the town.